Hello and Welcome to Tape Op #100! | Tape Op Magazine | Longform candid interviews with music producers and audio engineers covering mixing, mastering, recording and music production. Hello and Welcome to Tape Op #100! This issue marks the occasion of our 100th issue of Tape Op. As I sat on my front steps 18 years ago, spray painting photocopied magazine covers by hand, I never would've imagined that my crazy little idea would ever have carried on this long, found so many readers, or become such a huge part of my life. Over the years Tape Op has certainly changed. What started as a magazine mostly focused on creating and tracking what would become known as "indie rock" (hey, that was the world I mucked about in! ), has become a forum about working with every style of music, from any era. While early issues featured ads from small record labels and independent book stores, the last 15 years have seen advertising for every kind of recording product one could imagine; even including Pabst Blue Ribbon beer, at one point. But while there have been changes, I feel that the core values of this magazine remain the same, even if they're not always visible on the surface. Creativity, passion, beauty, excitement, and honesty remain an important backbone for what we discuss and promote in these pages. Pushing the art of recording forward, while always respecting the artist and the music, is key as well. Almost everyone involved in Tape Op records music, and most of us at the professional level. When we interview a recordist it is as a peer, not simply as a journalist or a fan (though we can wear those hats too). I think these things are just the tip of the iceberg as to what makes Tape Op different, as well as what draws our readers to the magazine. For this issue I trawled through 100 old copies of this mag and found 100 corresponding quotes — one from each issue. I've always seen Tape Op as an extension of my own growth and learning when it comes to recording music, and many of these quotes are ones that have resonated with me for years. John La Grou, owner of Millennia Media and a fine recordist himself, has written up a piece for us on his thoughts about the future of music production — you may be surprised (or distraught) to learn where he thinks it is heading. Gerald Seligman of The National Recording Preservation Foundation discusses preserving historical recordings. Barry Cleveland illustrates many of Joe Meek's innovations in the studio. There's far more about the future and the past of recording in this issue, so get to it. 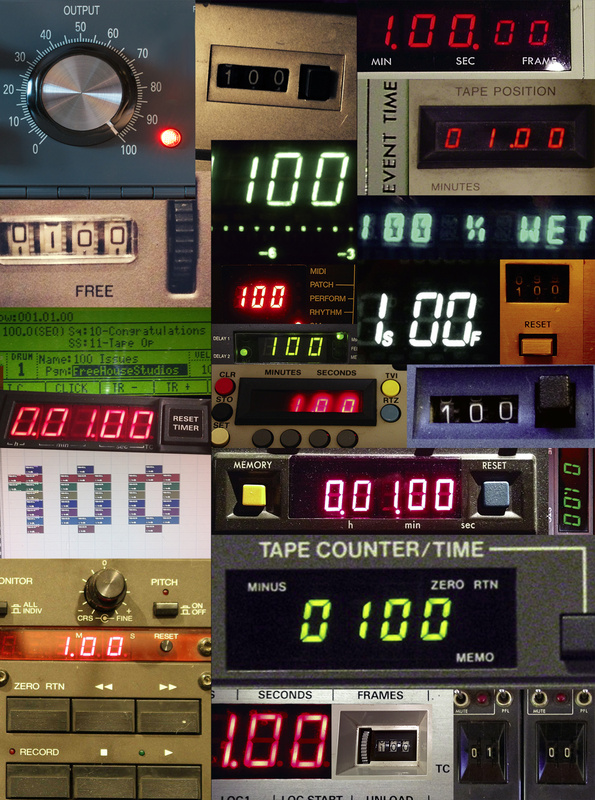 And get ready for another 100 issues of Tape Op! PS: Many thanks and a raised glass of wine to my partner/publisher/friend John Baccigaluppi. Without him Tape Op probably would have disappeared into a fog of credit card debt and exhaustion 14 years ago. He believed in my vision, and took it up a big notch overnight. He is the backbone that lets this magazine flourish, and I don't think it could be what it is without his hard work and input. Also I owe a HUGE thanks to the many contributors and "staff" over the years. Many of you are my close friends and have helped guide the magazine. You know who you are. Thank you.